Very Good. Glued binding. Paper over boards. With dust jacket. 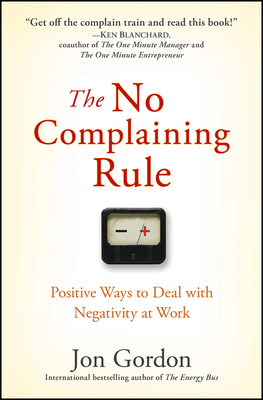 155 p. The No Complaining Rule shares the simple, yet profound, message that negativity and complaining are sabotaging the people, culture and success of far too many organizations. The book will first assess if you are indeed a complainer and what kind of complainer you potentially are. New. Glued binding. Paper over boards. With dust jacket. 155 p.
Very good. A copy that has been read, but remains in excellent condition. Pages are intact and are not marred by notes or highlighting, but may contain a neat previous owner name. The spine remains undamaged. The dust jacket is missing. At ThriftBooks, our motto is: Read More, Spend Less.